We spent over 7 days researching and testing 15 different types of diesel fuel additives and found that benefits offered to the engine, Number of treatments per bottle, and ease of use were most important. Sta-Bill Cetane Boost fuel additive scored high marks in all categories and is our top pick. We noticed an improvement in fuel economy after a week of using this product and the vehicle ran better as well. We could use this product in all types of diesel fuels including ultra-low sulfur diesel, biodiesel fuels, and biodiesel blends and cleans the injectors, lubricates fuel injection components and helps vehicles run better. With rising food, utility and fuel prices many vehicle owners are looking for ways to improve the gas mileage and fuel efficiency of their vehicles. This is even more important when you are dealing with diesel fuel vehicles. One easy way to take care of this problem and help raise the fuel efficiency of diesel engine vehicles is to use diesel fuel additives. There are many things diesel fuel additives do for a diesel engine. For starters, they provide both hot and cold weather protection, clean and prevent deposit buildup, remove water, fight rust and corrosion, lubricate and reduce the wear of critical components like injectors and reduce smoke emissions. With all of these potential benefits, it is important to choose the right diesel fuel additives. There are brands that are better than others and these are the ones you want to find. There are some things you should take into consideration when you are researching these additives. This guide will provide you with what those things are and will help you sort through the many different diesel fuel additives that are on the market. 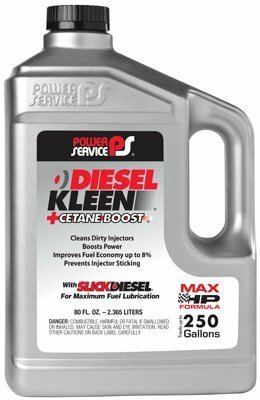 Diesel Kleen + Cetane Boost improves the performance of diesel engines by boosting cetane, cleaning the injectors and lubricating fuel injection components for starters. It can also restore engine power that has been lost and improve fuel economy as much as 8% making the fuel savings higher than it costs to purchase the additive. Cetane can be boosted as much as 6 numbers resulting in a smoother running engine that experiences far less power lags. Diesel vehicle owners will enjoy faster cold starts and a reduction in the need for downshifting when driving in high-load conditions. This additive is effective in all diesel fuels including biodiesel blends, ultra low sulfur diesel and biodiesel fuels. There is also no worry of diesel exhaust damage in vehicles with engines 2007 and newer. 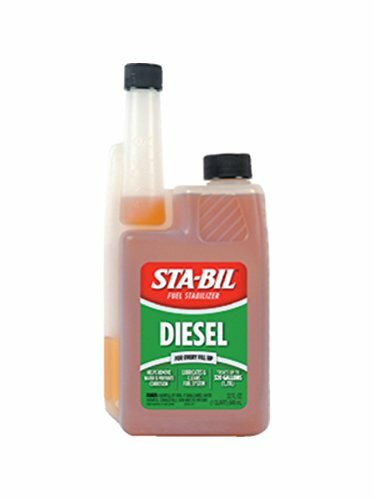 STA BIL diesel fuel stabilizer provides diesel engines with all kinds of improvements including keeping the fuel fresh for fast, easy starts. This additive can be used every time you fill up the tank and it is safe to use in all diesel engines, even marine and agricultural engines. This 32 ounce bottle treats up to as much as 320 gallons of fuel. This concentrated cetane improver contains an effective fuel stability package that helps provide improved performance and power in all diesel equipment. It also increased gas mileage and makes maintenance much more economical since less is likely to go wrong when you are taking care of your diesel engine this way. Other benefits of this beneficial product include lubrication of the injectors and fuel pump. Stabilization of the fuel and a boost in cetane, removal of free water from the system that can cause problems if left there. And a coating of the tank and fuel lines with an inhibitor that resists rust and corrosion. This bottle will treat 75 gallons of diesel fuel. You can use it at every fill up for ongoing performance improvements. Diesel fuel additives added to your fuel can make a big difference in the performance of your vehicle. There are many benefits that you will notice when you have been using the additives for awhile. When choosing an important product such as this, you want to be certain that you have chosen a good quality one that will provide all the benefits it can. Not all diesel fuel additives are the same so you need to do your due diligence when researching to ensure that you choose the best quality diesel fuel additive you can get. The three diesel fuel additives reviewed above are all examples of high quality products that you want to look for when adding something like this to your own vehicle’s fuel. Any one of these three products will provide you with improvements to your vehicle’s engine and fuel systems that will extend its life and improve your fuel efficiency and gas mileage. To learn much more about diesel fuel additives and how to choose the best one for your vehicle, read the buyer’s guide below. It has information that will help you sort through all of the different choices and make an informed decision as to which one is the right one for you. Diesel fuel additives are chemicals that are added to the diesel engine’s fuel to help improve several functions the engine has. There are many different kinds of additives and each delivers benefits that will improve your engine in many ways. Some additives are specifically for racing while others are for more day to day use. Knowing what your own vehicle’s needs are is important when it comes to choosing the right fuel additive. Continue reading below to learn more about what you should look for. One of the most important functions of a diesel fuel additive is to keep the injectors and fuel system clean. Clean injectors work properly, spraying a fox-tail like mist of fuel which allows the engine to have efficient combustion. When the injectors are dirty, this affects the uniformity of the mist that is released. This will have effects on gas mileage, idle quality and the output of power to name a few things. Other benefits include the prevention of gelling in cold weather. If the right additive is not present, diesel engines won’t start reliability when the temperature drops. Add in helping to deal with low fuel filterability, insufficient detergency, protecting fuel that has been standing for a long period of time, water contamination and more and you have a great product on your hands that will bring out the best in your diesel engine. Improving environmental effects – Using a good quality fuel additive can reduce the amount of carbon emissions that are released by the diesel vehicle. The additives that you add to your diesel vehicle help reduce the negative effects that a diesel engine can have on the environment. While it doesn’t eliminate them entirely, it does help increase the eco friendliness of your vehicle. By using these additives, you can continue to drive your diesel vehicle while helping to protect the environment. Increase in Power – There will not be a huge increase or change in power, but depending on which product you choose, the fuel additives will increase the power and running efficiency of your vehicle. By ensuring that the engine is burning the fuel efficiently, the piston strokes will have much more power. It will not happen instantly, but after the additive has taken effect you will be able to feel the difference when you drive. Savings in Fuel Costs – People purchase diesel fuel additives for one reason and that is to improve the performance of their vehicle so they save money on gas and maintenance costs. With gas costs rising all the time, having a product that can help your vehicle save money on gas costs. Your fuel economy could rise by as much as 8%. If your country has low fuel quality, those savings may be as much as 10-20% fuel savings. This savings comes from the ability of the fuel additive to eliminate the combustion deposits. Doing this reduces the fuel’s effectiveness and longevity. Cost Effective & Easy to Use – Anyone can use diesel fuel additives if they have a diesel engine vehicle. The process of treatment is simple and easy to understand. All you have to do is open the gas tank, add the amount of gas you want to purchase at that time, the more the better and then pour in the additive using the recommended amount that the bottle instructs. That’s all there is to it. Some products even state that you can add this additive every time you fill up. With all of the benefits listed above, it is no wonder people like to purchase these diesel fuel additives. If you have a diesel engine vehicle it would truly benefit you to purchase a diesel fuel additive. Diesel fuel additives have played a very large role in improving fuel delivery efficiency by controlling how the fuel burns. Controlling the speed and temperature ensures that more energy is produced. Increases in power, reductions in the wear and tear on the engine and increases in acceleration and torque are just some of the reasons diesel fuel additives are excellent investments in your vehicle’s performance and lifespan. Another way to really help the environment when you have a diesel engine is to use High Performance Diesel fuel along with the additives. It will make a big difference in the way your vehicle runs and the longevity it provides. The three diesel fuel additives we have featured above are all excellent choices if you want to find a high quality fuel additive that will make a real difference in your vehicle’s power, efficiency and lifespan. They are all cost effective too, and won’t break the bank despite creating some pretty significant changes in the way your vehicle runs. If none of these three work for you, use the information in this buyer’s guide to research the different products available and sort through them, eliminating the ones that don’t work for your needs. If you take the time to do the research, you will easily be able to decipher which brands of diesel fuel additives are good and which you should let pass. The quality of the product you choose plays a huge part in the amount of improvement your vehicle experiences. This is not an area you want to scrimp or go “cheap” in. The better quality product your purchase, the better the results will be.